ReportServer is a very adaptable open source reporting and dashboard solution that also supports Eclipse Birt, JasperReports and SAP Crystal Reports reporting engines. And that on top of its own ad-hoc oriented reporting features! The system uses a web-based user interface, and it plays with a variety of admin tools quite well. ReportServer comes in two offerings: the open-source ReportServer Community edition and the commercial ReportServer Enterprise version. ReportServer Community comes with all the essential tools and features you need to great reporting. The system is an ideal option if you are looking for a pixel-perfect reporting or even ad-hoc relational reporting. For businesses that demands extra flexibility, then the ReportServer Enterprise edition is a perfect fit. It is crearted on top of ReportServer Community and has all the features Community offers plus various additions targeted specifically at enterprise clients. ReportServer is designed to provide you with modern and versatile business intelligence (OSBI) platform. ReportServer Community Edition is an open source software under the aGPL and is an excellent option for those who need a comprehensive business intelligence platform without breaking the bank. For companies that are looking for enterprise functionality, they can’t go wrong with ReportServer Enterprise Edition. The system delivers pixel-perfect reporting, ad-hoc analyses, Excel and Word reporting or multidimensional OLAP analytics. With ReportServer, clients can work with as many users and groups as you want. With ReportServer, you have the perfect reporting engine for producing table-like reports to export them to Excel, CSV, PDF or HTML. The platform also offers an extensive permission management functionality to manage large-scale installations with ease. ReportServer is perfect for running Birt reports with minimal setup on, which results to pixel-perfect reports. ReportServer also the JasperReports library for pixel perfect reporting. JasperReports is a widely-used and extremely popular open-source reporting platform. ReportServer’s innovative scripting element delivers a solution to almost any use-case you might have. Script reports are the most adaptable reporting platforms available today. ReportServer provides users with a vast selection of flexible parameters to enable report customization. Report designers can take their pick from text-boxes, radio buttons, checkboxes, date parameters, popups and more. International users will surely love the multi language support ReportServer offers. The software has been translated into more than 30 languages, enabling users from major locations to fully leverage and use ReportServer. It also boasts n innovative and unique TeamSpace concept that enables teams to work together on reports. 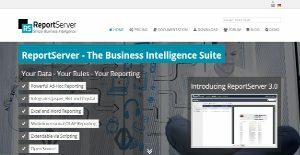 If you are considering ReportServer it might also be a good idea to analyze other subcategories of Best Business Intelligence Software gathered in our base of B2B software reviews. Since each enterprise has specific business needs, it is advisable for them to desist from seeking a one-size-fits-all perfect software application. Needless to say, it would be useless to try to find such an app even among market-leading software platforms. The intelligent thing to do would be to list the various essential factors that need consideration such as required features, budget, skill levels of employees, company size etc. Then, you should do your groundwork thoroughly. Read some ReportServer reviews and investigate each of the other systems in your shortlist in detail. Such comprehensive research can make certain you weed out ill-fitting applications and select the system that presents all the elements you need for business success. How Much Does ReportServer Cost? We realize that when you make a decision to buy Business Intelligence Software it’s important not only to see how experts evaluate it in their reviews, but also to find out if the real people and companies that buy it are actually satisfied with the product. That’s why we’ve created our behavior-based Customer Satisfaction Algorithm™ that gathers customer reviews, comments and ReportServer reviews across a wide range of social media sites. The data is then presented in an easy to digest form showing how many people had positive and negative experience with ReportServer. With that information at hand you should be equipped to make an informed buying decision that you won’t regret. What are ReportServer pricing details? What integrations are available for ReportServer? If you need more information about ReportServer or you simply have a question let us know what you need and we’ll forward your request directly to the vendor.